﻿ Color Trends in the UK-2017 | The Great Shutter Co.
With the beginning of each new year we observe a shift in trends regarding fashion & lifestyle and this relates also to the colours for example that we use in our homes. In general the trend is moving towards a “less is more” approach and this is reflected in the increased use of neutral colors with splashes of bold accent colors here and there to balance out the spaces. We, at THE GREAT SHUTTER Co. Ltd , stay aware of the most recent trends and incorporate that knowledge into the suggestions we make to our customers. We can match our premium window shutters to the color palettes of all the well-known paint manufacturers and can even take the color swatches for your desired tones and get them matched with the shutters and this for the reasonable cost of £200. Neutrals: The trick to get beautifully balanced interiors is by selecting the perfect tones for each space. And as far as neutrals are concerned, one can never go wrong with them, if utilised astutely. The advantage of using neutral backdrops is that the furniture pops out and creates a warmer and more welcoming atmosphere. The neutral palette gives way to a wide variety of home styles that can be incorporated, as it goes well with all of them. Another plus point is the fact that it gives a chance for those more intense and sharp tones/colour palettes to stand out within the room without being unforgiving on the eyes. Ombre: As the word literally means, “to shade”, the ombre effect turns the spaces into an imperfectly perfect art-piece. The outcome is generally a sophisticated look which gradually sees dark to light in a specific hue, creating a softness and flow within the interiors. The Ombre style can be applied not only to the walls, but also to the stylistic layout of your home or home accessories. Again you may chose a colour for your shutters that merges with your wall colours and those of your window surrounds. Accent Colors: Even though accent colors are usually the boldest shades of a color, for this year, go for more soft-mid tone shades instead. As discussed earlier, to break the neutrality, sharp hues are needed, but keeping a friendly yet mysterious color palette for the accent colors will give the spaces a more exquisite and sophisticated look. Take a stab at going for ochre and not yellow, carmine rather than red, midnight blue rather than brilliant blue, wine purple and not violet. With a shrewd mix of neutrals with these tints, you can have a look that is right out of the pages of a lifestyle magazine. Wooden Natural Look: If there’s one thing that is consistent, it is the look that bare wood provides to any space. To have that more earthy and warm, cosy interiors, the use of wood has been consistently used throughout the years. Polishing the natural wood and using it in furniture or décor, leaves the space with a more rustic appeal & conveys closeness to nature. The hues of natural wood, combined with neutrals, create a subtle atmosphere with an openness & calm environment. We have over 18 different stain colours in our premium wood shutter ranges. If you want FSC certified wood shutters please purchase our Winchester Shutter range. 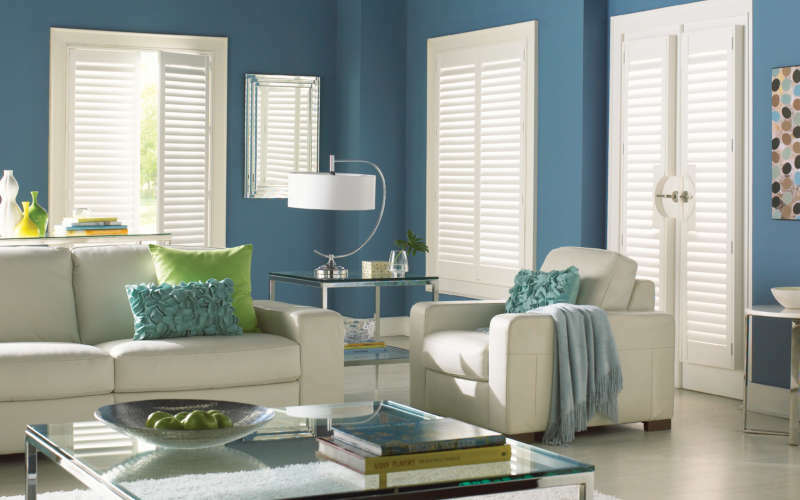 All of our wood shutters are either plantation woods or FSC certified.